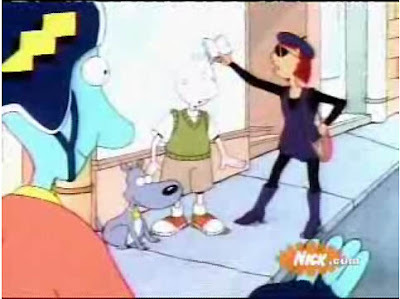 Remember Doug? I randomly remembered Judy, his awesome existential drama-obsessed sister this morning while I was getting dressed. 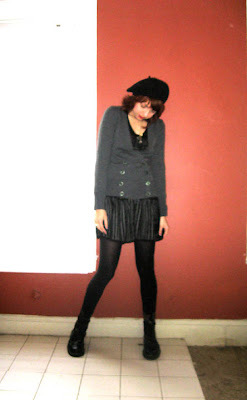 She always wore a purple jumper, a black tshirt, black tights, boots and a beret. She was the ultimate in cool (notice how the sides of her head are SHAVED!) so I decided to channel some Judy Funnie today. The black dress is from Tibi (I used to work there so most of my dresses are from there). It's a little hard to wear because it's a basically a paper bag with a drop waist so I always have to layer it or wear it with some really chunky shoes. As soon as I got my Docs in the mail, I knew that the dress would be perfect with them since it's so light and airy. The deep v-cardigan is from H&M, from about 3 years ago , when I went on an "oversized" sweater buying spree cause I wanted to look like I'd stepped out of a Stella McCartney runway. Of course, now I look at it and it doesn't seem oversized at all, but it did the trick back then. Of course I needed to wear a beret, because that was Judy's signature and this one I stole from my mom one of the times she came to visit. I think she got it in Paris. Sorry mom! You should know by now that I'll always steal your accessories. I did wear little boy shorts under it in case the wind got the best of me. I feel pretty rad in this today. I feel really weird posting pictures of myself and stuff, so um yeah, bear with me. om my god this is an amazing reference. i love it. you look so cute! 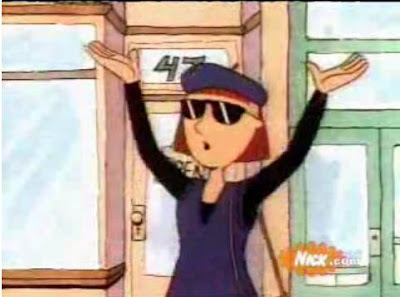 i think judy funnie just might is one of the unsung heroes of cartoon style. way to do her justice! I loved -may I actualize the verb?-Judy! haha, annie, doug will always remind me of summers at your house and playing with naelle and being happy. haha, that's nice! but your temples aren't shaven ;) fortunately! HA! I love this, great original post. but now i have to update the fact that laia is the coolest ever!